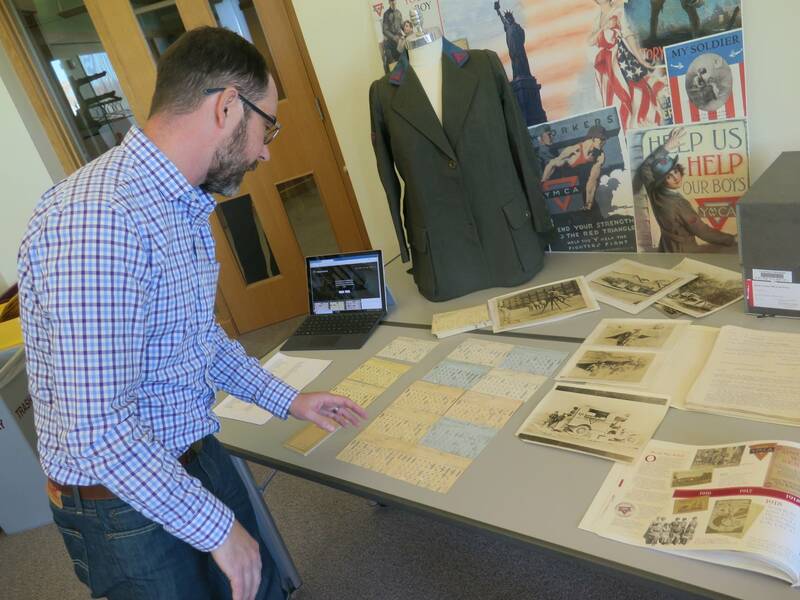 Sunday marks a century since the guns of World War I fell silent, and to mark the anniversary, the University of Minnesota is highlighting some of its extensive collection of First World War materials. The U's archives show how the first-of-its kind cataclysm touched every aspect of American life. They're a meticulously cataloged collection of books, documents, posters and other items on everything from agriculture and politics, to religion and wartime controversies involving the university itself. Much of the collection is kept below ground in an enormous climate-controlled storage cavern carved from the river bluff underneath Elmer L. Andersen Library. Special collections curator Tim Johnson grabs a box from one of the 24-foot high shelves and pulls out a few pamphlets, both pro- and anti-German. "Part of the interest to me is who's producing these and are they bending the truth a little bit? In some ways these have a very contemporary feel to them in terms of how messages are sent out," Johnson said. Johnson estimates the university's WWI collection to be in the hundreds of thousands of items. But it's hard to say exactly, because they're spread out through many subject areas. There are countless photographs, a pristine collection of postcards and thousands of posters. One urges young men to "Fall in. 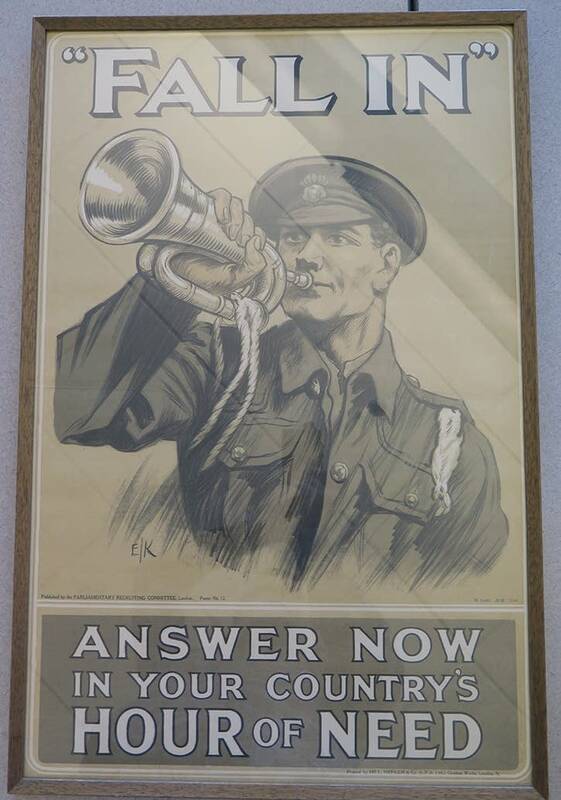 Answer now in your country's hour of need." The archive also includes documentation of the prejudice that German-Americans faced. An anonymous note forwarded by the Minnesota Commission of Public Safety to the U's Board of Regents denounces political science professor William Schaper as "rabid pro-German." Archivist Erik Moore said Schaper — who was born in Wisconsin to immigrant parents — had no way to defend himself. "He was called in to the Board of Regents office on Sept. 13, 1917, and with no other evidence was fired from his position at the university," Moore said. Two decades later, the university apologized to Schaper and offered him his job back, but he'd long since moved on. Moore said the incident led directly to university policies ensuring academic freedom and establishing a system of tenure. Even before the U.S. entered WWI in April 1917, many Americans were already serving overseas as volunteers with the YMCA. U archivist Ryan Bean said that 100 years ago the YMCA provided critical wartime relief services around the world. "They ran athletics, they ran religious services, they taught," Bean said. "They ran the gamut of what could be done for individuals." 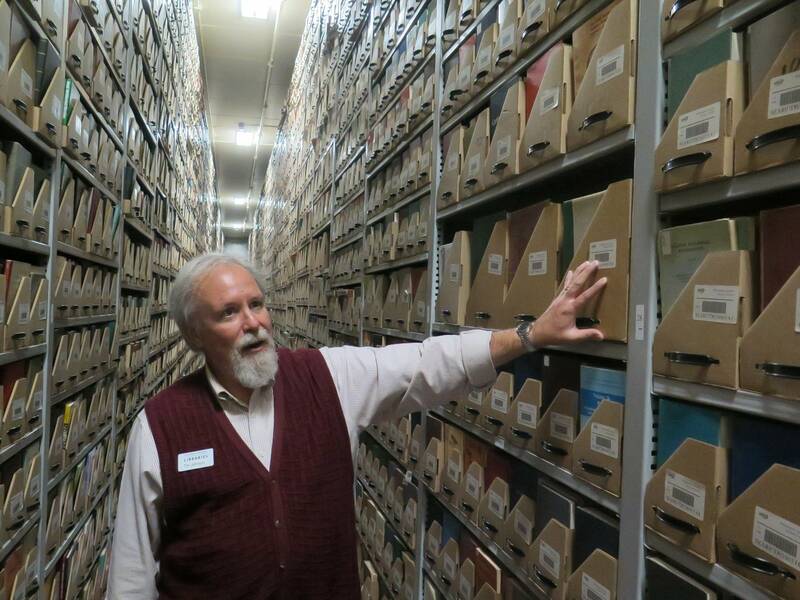 In the 1980s, the national YMCA sent its archives to the University of Minnesota. Bean, who oversees the collection, keeps track of the nearly 26,000 punch cards that contain information about all those volunteers. Among other things, holes in each card denote a person's language, job skills and religion. The cards were sorted by machine. Bean said the vast analog paper database allowed the YMCA to deploy people with particular skill sets to specific places. "They used this information to help figure out what categories were needed in what types of areas around the globe and be able to mark up those orders and send them out," Bean said. Some items reflect the institutional racism of the era. There are entries for "colored work." And cards for African-American volunteers are blue, to speed up the process of segregation. Some famous people served as YMCA volunteers a century ago, bringing a bit of home to soldiers over there. 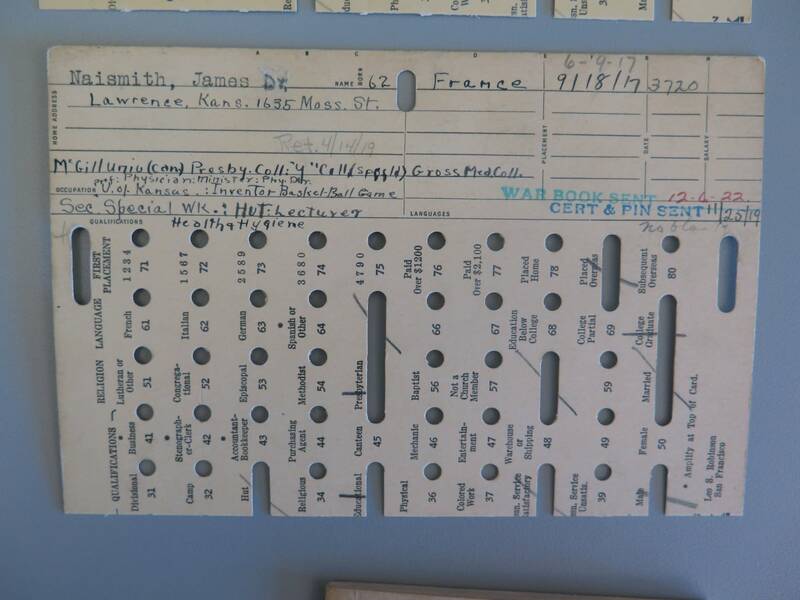 A punch card for Mrs. Theodore Roosevelt Jr., also known as Eleanor Butler Alexander-Roosevelt, identifies her as a French speaker who was sent to France. John D. Rockefeller Jr. volunteered stateside. James Naismith of Lawrence, Kan., though not a Francophone, was sent to France too — likely to help with recreational activities including basketball, the game he invented. All of the cards have been scanned and put on the website Zooniverse. 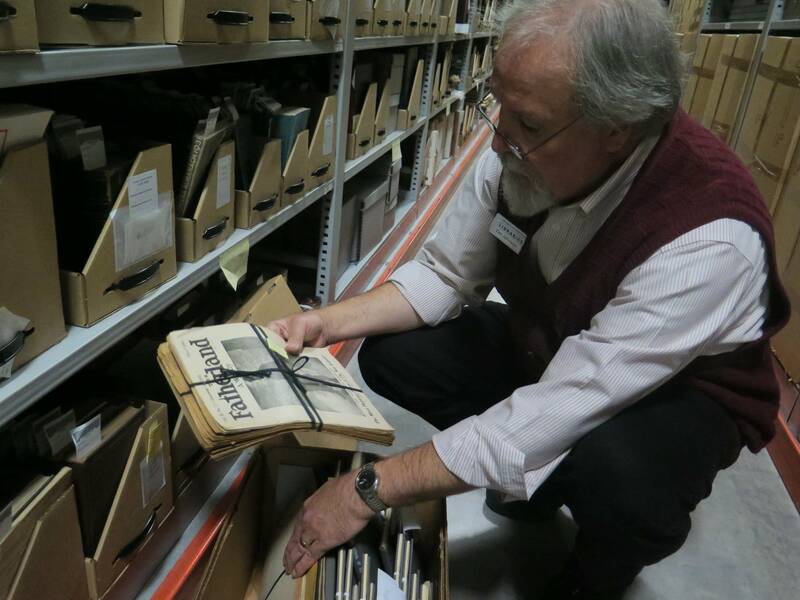 University archivists are seeking modern-day volunteers to go online and help classify them. Bean says the goal is to build a database open to scholars, amateur genealogists and anyone else interested in this pivotal period in history.